One of the centerpieces of any studio gear setup is a microphone. A condenser microphone is incredibly useful when it comes to the accurate following of sound waves at all frequencies. It also has a greater transient response which gives your voice a natural feel. Condenser microphones are generally expensive than dynamic mics, but this does not mean you’ll have to spend a fortune to acquire a reliable one. In the $200 to $300 price range, you’ll find large diaphragm mics that open your musical world to great studio vocals recording or even outdoor live performances. Let’s take a look at the TOP BEST that stacked up against the competition. When you want to create award-winning music, you’ll want a mic that does not have you making compromises. The SE Electronics sE200a proves to be just that mic as it comes with the elements for all-around sound recording. It boasts high SPL and hand-crafted diaphragms. Not to mention, it has three distinct polar patterns. This means that no matter the environment you are in, you can make great, catchy music. This is a flexible condenser mic as it integrates a pop filter and a quick-release shock mount. The shockmount attaches in one simple motion to the mic giving you a stable mic. We also like that the pop filter is vertically adjustable which offers you amazing flexibility. The multi-pattern option allows for use with both vocals and instruments. Anyone who needs their music to sound rich on a budget had better be using the Studio Projects B1. This large diaphragm mic is equally great for close-miking amplifiers as it is for recording, broadcasting, and production. This mic is adequately quiet such that it works great in home studios for vocal and instrument recordings. 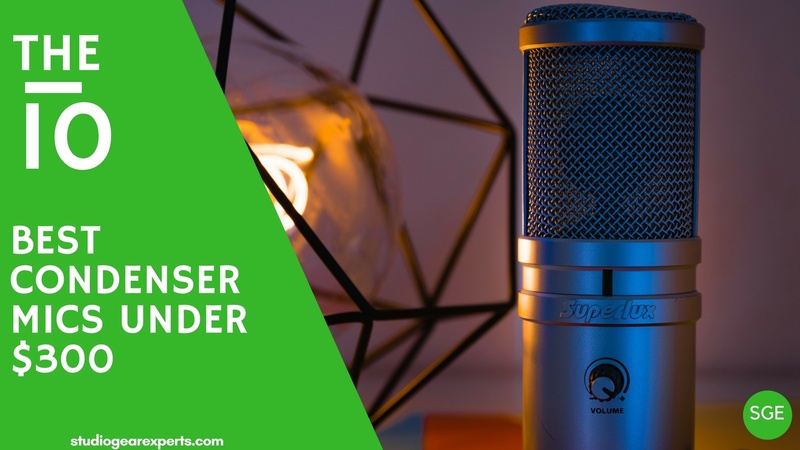 If you are more into acoustic instruments a condenser mic that is both professional to support live performances and studio recordings is your best bet. BEHRINGER B-2 Pro ensures you can have high-end sound quality at a very subtle price. It features a low-filter, selectable patterns, and inbuilt shielding. You can choose from the cardioid pattern, omnidirectional, or the figure-8pickup pattern. When dealing with high-volume signal sources, the cardioid pattern works to eliminate any background noise. Hence you’ll always love the sound of a smooth recording. This device is robust. It features a nickel-plated brass body. This means it is resilient to vibrations and falls so you’ll be having it for a really long time. Audio Technica is known for producing masterpieces in music production. The AT4040 model is a large diaphragm unit with uncolored sound and a cardioid pick-up pattern. You can record in virtually any indoor environment including professional studios and home studios. This mic is mostly sought for the crystal clear noise response as well as the solid build. This mic is excellent on vocals especially with the help of the low cut filter. It removes any muddiness which makes your music pop in mixes. For loud instruments, you have the support of the -10db pad which gives pronounced tracking. We love that this mic brings out natural sounds as it is highly sensitive. The Rode NT1A is a studio-grade large diaphragm mic. It has probably the smallest noise levels that assure you of capturing the cleanest audios. It works well with vocals and acoustic instruments since it is highly sensitive. It can pick up the simple recording nuances that make a recording sound natural like your finger striking the guitar string. You’ll notice the presence bump at high frequencies which makes your music sound exceptional when played on monitors. Although this mic comes at an entry-level price, it is nicely engineered such that it chunky and needs a heavy-duty stand. Rode NT1A also comes with a decent shockmount which is pretty simple to install. Every new musician needs a high-quality condenser microphone without going over the budget. The Audio Technica AT2035 is a large diaphragm mic that suits both indoor and outdoor applications. You can record great music from the comfort of your home studio and also take it to live performances. It has a switchable 80 Hz high-pass filter plus a -10db pad. This unit boasts a sturdy construction unlike what you’d see on other mics in this price range. It delivers low noise thanks to the cardioid polar pattern. Apart from the noise isolation you also get a device that has a wide dynamic range and high SPL handling. Not to mention, it comes with the shock mount and a protective pouch which maintains its high-quality for a long time. It does not come with all the needed accessories you’ll have to buy them separately. As you can see, being on a budget does not mean ending up with a condenser mic that spells trouble. When you know what you are looking for, you can own the best condenser mic under 300 dollars. We’ve demystified the qualities that distinguish the great from the just good models to ease your pick.